Location of Curran in Sangamon County, Illinois. Curran is a village in Curran Township, Sangamon County, Illinois (United States). It was incorporated in 2005 and had an estimated population of 212 in 2010. Curran is located a few miles west of Springfield and is part of the Springfield Metropolitan Statistical Area. Curran is located at 39°44′32″N 89°46′19″W﻿ / ﻿39.74222°N 89.77194°W﻿ / 39.74222; -89.77194. According to the 2010 census, Curran has a total area of 2.07 square miles (5.36 km2), all land. Curran is governed by a typical village administration consisting of a Village President and six Trustees. The first village-wide election took place in April 2007. Brian Markley is the current Village President. The Village Clerk and Treasurer are appointed. ^ "USGS detail on Curran". Retrieved 2008-02-09. ^ "Boundary Changes". 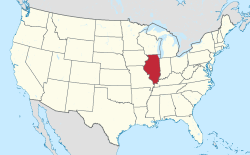 Geographic Change Notes: Illinois. Population Division, United States Census Bureau. 2006-05-19. Archived from the original on 2010-08-06. Retrieved 2008-05-28. ^ "Table 4. Annual Estimates of the Population for Incorporated Places in Illinois: April 1, 2000 to July 1, 2007". United States Census Bureau, Population Division. 2007-07-10. Archived from the original (CSV) on 2008-09-26. Retrieved 2008-07-11. ^ "Village officials". Retrieved 2008-05-28. ^ "April 17, 2007 Election Results". Sangamon County Clerk. Archived from the original on 2011-07-23. Retrieved 2008-05-28. Village of Curran – Official site. Sangamon County – Official site. This page was last edited on 29 December 2018, at 15:56 (UTC).